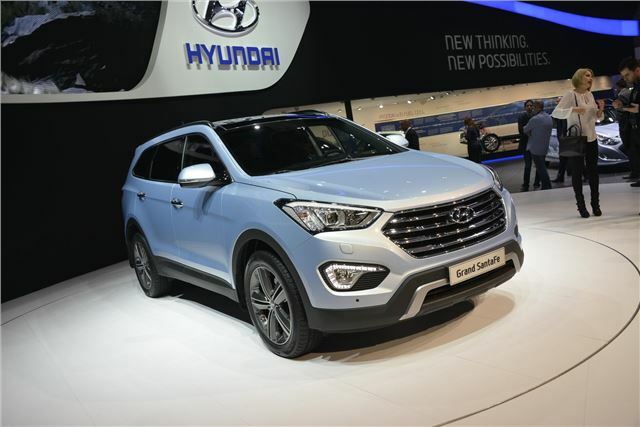 Don't get too attached to the Hyundai Grand Santa Fe, as it won't be coming to the UK. It's aimed fairly and squarely at the full-size MPV market, epitomised by the Chrysler Voyager - and it's currently too small a market to justify converting it to right-hand drive. The Grand version looks very similar to the recently-launched Santa Fe, but with a new grille, front bumper, and a longer wheelbase to seat seven people in comfort, it's a very different proposition. The new model would be perfect for the long-distance airport run market - and would also look the part, thanks to large 19-inch wheels. The interior has been given a makeover, too. There's more equipment and a higher quality feel to the trims and materials used - and airiness has been improved thanks to a full-length panoramic sunroof. Standard equipment includes three-mode adjustable steering (like the i40) and a 4.3-inch centrally mounted touch screen. The Grand Santa Fe uses the 2.2-litre CRD shared with other Hyundai models, and has a six-speed automatic transmission. Maximum power is 194bhp and CO2 emissions are 192g/km. If you'd like to see this car come to the UK, then you need to lobby Hyundai.